Amara shows Dean how she’s torturing Lucifer. Worried for Castiel, Dean and Sam come up with a plan to rescue him from Amara’s clutches. 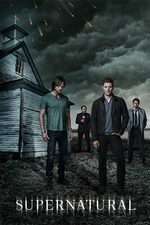 After the Winchesters express doubt about him, Chuck transports them back to the Bunker where he brings in the spirit of Kevin Tran (Osric Chau) to vouch for him. Chuck then sends Kevin to his final rest in Heaven. Chuck explains that he had once been much more hands-on with the world, but didn't seem to be making a difference so he left the world to find its own way but has returned to face Amara. At the same time, Amara continues to torture Lucifer and contacts Dean to send a message to God about Lucifer's state. While this is going on, another of Amara's fogs wipes out a whole town but results in a man named Donatello being called as a Prophet. As the Winchesters go to meet with Donatello, Metatron contacts them and reveals that Chuck intends to sacrifice himself to Amara to stop her destruction of the universe. After Dean fails to convince Chuck to stop his plan, the Winchesters team up with Metatron and Donatello to rescue Lucifer. To distract Amara, Dean meets with her and Amara suggests that he give up his humanity and become a part of her instead. Eventually Amara realizes that Dean has betrayed her and departs to stop Lucifer's rescue. Donatello is able to lead Sam and Metatron to Lucifer who agrees to put aside his differences with God to battle Amara. Metatron frees Lucifer and stays behind to hold off Amara when Lucifer can't teleport them out. After Metatron's attack fails, Amara implodes him into nothingness. Amara nearly kills Sam, Lucifer and Donatello, but Chuck teleports them back to the Bunker. There, Lucifer and Chuck greet each other for the first time in millennia before Chuck heals Lucifer's injuries. The Winchesters send Donatello on his way and Dean informs Sam of Amara's plans for him. This was a solid episode. But filled with many great bits. Chuck is great! No one expected Megatron to go out like that but good for him. When Chuck healed Lucifer, I thought for a moment that he was healing Castiel and he was going to free Castiel from Lucifer's possession, so we'd get Castiel back and Mark Pelligrino would be playing Lucifer again. But, no. I'll be curious to learn why Lucifer is still possessing Castiel when Chuck could just handwave him out of there. I wish we could see the conversation in the writer's room where somebody said, "This show has been just OK for a while. What do we need to do to make it great again? What risks do we need to take? What do we need to stop doing, what do we need to get back to doing, and what do we need to do that we've never done?" Because you know that conversation happened. Ursula, I totally agree with you on the writer's room. Something definitely happened because the change in tone, direction, and quality was sharp. I recall a couple years ago someone on the show opened up a discussion on social media expecting some pleasurable interaction and got a deluge of disgruntled fans venting. Maybe someone is finally paying attention. Lucifer said Michael wasn't exactly in good shape back in the cage. Then again, Lucy has some issues with telling the truth. Michael's return would be pretty damn catastrophic, not to mention fun. Then's there the question of Adam..still in Hell. Dad, still in Hell. And why why why did they have to kill the Trickster/Gabriel?! Oh, so much they could do going forward. Did they ever explain what happens to angels and demons when they actually die? Like there's no trace of soul or vessel or anything? So there's nothing Chuck can use to bring back Gabriel and Metatron? Despite being God, Chuck doesn't exactly seem all-powerful. He doesn't seem able to see the future, for example. (He also doesn't seem to be a very good writer, judging by his reviews.) And it seems like some of the Old Testament stuff was really stuff Chuck did, and some of it was just stories. While I doubt they'll ever explain just how Jesus fits (or doesn't fit) into the Supernatural universe, they may surprise me. They've been surprising me lately! I think the debate last episode about Keith Richards' Life vs. Brian Wilson's Wouldn't It Be Nice? was kind of a mission statement for the show, too. I still enjoyed the show the last few seasons, but I never imagined it would get this lively again. I'm really liking this development, with the caveat that the more I like it, the more dubious I am about S12. Chuck-as-God is really working for me. Someone actually put some thought into this. Despite being God, Chuck doesn't exactly seem all-powerful. He really doesn't, does he? That's my favorite part of the whole deal. Most of the properties modern Christianity ascribes to God are extrapolations. Chuck's got a very old school feel to him, more like Greek deities or the like. He's more powerful than a person, and could presumably *end* the world any time he wanted, but the details and sweep of history are bigger than he is. I love that. Given his conversations with Metatron and Dean, the theology on the show actually strikes me as pretty coherent, which is something I never expected to say. I really bought his talk about being God as parenting, and why he stepped away. I also love his doubt and uncertainty. Chuck's fallibility also fits with the general feel of the Supernatural world: everything is sort of shabby in the end. Chuck has been God since I watched the original 5 or 6 seasons of the show years ago. I took a years-long hiatus as it got so bad when the current writers took over but I knew Chuck was God so they must have covered it at some point back then. Chuck has been God since I watched the original 5 or 6 seasons of the show years ago. Jensen Ackles' acting in that first scene was terrific. I feel sometimes like both of the guys can be phoning it in with these characters (which is understandable, given how long they've been playing them), but when he was reaming Chuck out there I was reminded that indeed, he is a talented professional actor. Late to the party, but yeah. Way back when they came as close as they could come to saying "Chuck is God" without actually uttering those words. When he showed up again, before any line of dialogue, I went, "Yep. God's back." Oh, and I totally agree, something something. Ackles is great. I'm so happy to still have him in the role but I also feel like he's slumming? He should have a much more interesting career than he does. Somehow this episode just makes me want to temporarily depower Chuck and Amara and let them hash out their issues in a locked room for hours without the ability to nuke each other, just to see what would happen.